Buffalo chicken is not just for wings! Place the chicken breasts in the base of the slow cooker and sprinkle the ranch dressing mix over the top. Pour the buffalo wing sauce over the top. Set on low and cook for 8 hours. Once the chicken is cooked, shred with 2 forks and combine with the sauce. Strain excess sauce before adding the chicken to the wraps. Assemble the wraps. 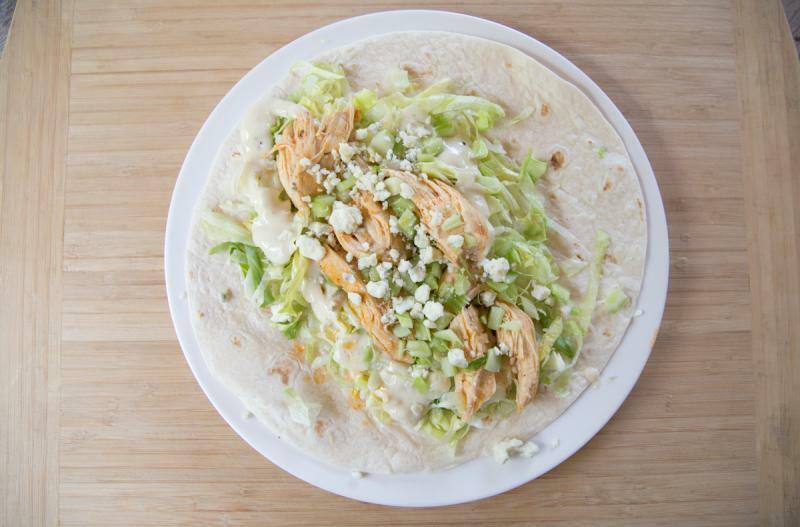 Set up the flour tortillas and add the shredded chicken and a little sauce plus the shredded lettuce, chopped celery, crumbled blue cheese and Ranch dressing. Wrap up and serve. Serve Buffalo Chicken Wraps with a side of fruit. Put baggie in the freezer and freeze up to 6 months in fridge freezer or 12 months in a deep freezer. Thaw in the fridge overnight, or a warm bowl of water for about 20 minutes, before transferring to the slow cooker and cooking on low for 8 hours. Shred the chicken once it is cooked, and then assemble the wraps as directed. Omit the blue cheese and use homemade Ranch dressing and mix for dairy-free meal. Omit the flour tortillas and serve in lettuce wraps. Thaw and slow cook on low for 8 hours. 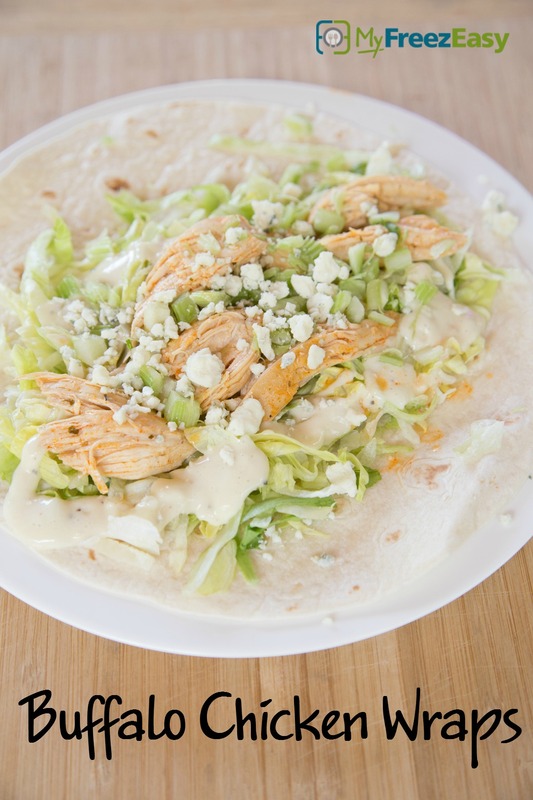 Once cooked, shred the chicken and then assemble wraps with tortillas, chopped celery, crumbled blue cheese and Ranch dressing.